You Americans love your SUVs and crossovers, huh? You wouldn’t buy Volkswagen’s sedans and Beetles and demanded their precious diesel Golfs be sent to regulatory jail? Well, Volkswagen has got something in store for you, and not just the huge new Atlas: it’s a new Tiguan, like the one the Europeans get, except huger. Happy now? On the eve of the Detroit Auto Show, Volkswagen pulled the wraps off the Tiguan destined for the U.S. market, and lo and behold it addresses the criticism most people had with the original—that it was too damn small. This is the MQB-platform Tiguan we first saw last year, except 10.7 inches longer and with a third row of seats. 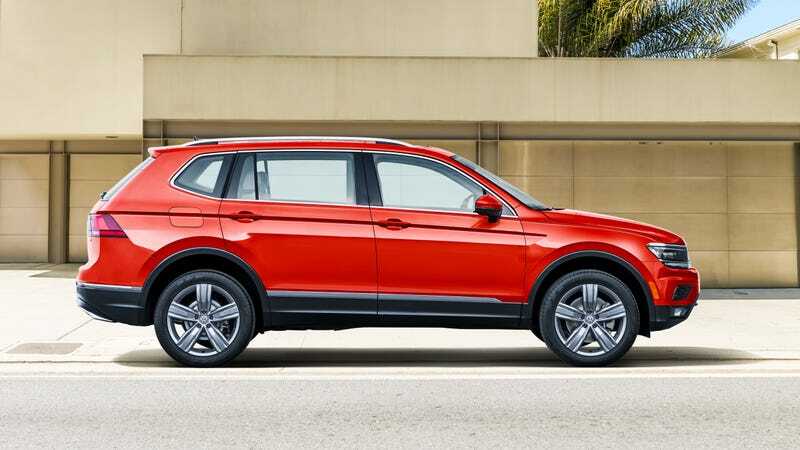 In other markets it will be called the Tiguan Allspace, and it’s the only Tiguan that will be offered in the U.S.
As expected, this U.S. Tiguan will be powered by a 2.0-liter gasoline turbo four, putting out 184 horsepower and 221 pound-feet of torque. A diesel version is... unlikely. Front-drive is standard, 4Motion all-wheel drive is optional. Volkswagen says that third row will be standard on front-drive Tiguans and optional on the all-wheel drive models. I kind of preferred the badass rugged Tiguan GTE Active Concept, but I’m sure this will be better poised to get VW some of that sweet, sweet crossover money it so desperately needs. Tiguan, you are destined for mainstream sales success!